Why NOT to Do Medical Missions To fully go into all the reasons not to do medical missions would take too long. So here is a short version. NOTE: I think there are reasons why medical missions should be done, and can be done successfully… but one must honestly face problems. 1. Strategic Problems. Medical missions may have problems strategically. First, is the area of effectivity. Medical missions provide short-term medical care. But if there is no recognizable change in the overall physical health of a community a few months after a medical mission, was it actually effective? Many of the problems are chronic and cannot be addressed with a one-time mission. Commonly medical missions do not focus on training, which may lead to longer term health. Second is the area of efficiency. Even if they do accomplish something of value, it involves hundreds of man-hours and hundreds to thousands of dollars. The benefits may not justify the cost. Third is the lack of sustainability. With the exit of the team, the community tends to lack the training and material resources to continue the process. 2. Medical Problems. Medical missions often involve poor methodology. There is no time for proper diagnostics or follow-up. Focus tends to be on short-term curative methods, not on health training and community change. Additionally there is a Western focus of medical missions. Western medicine focuses on popping pills, rather than preventive care, local medical practices, healthy diet, and low cost local alternatives to Western pills. 3. Attitude Problems. Medical missions are typically driven by outsiders. As such there can be a paternalistic attitude where the focus is NOT on how a local community can care for itself. Therefore, there is a fear of dependency where a community comes to believe that solutions and resources are things that come from the outside. Additionally, medical missions often are… selfish. As strange as this sounds, when medical short-term missions are justified, the focus tends to not be on what is accomplished for the communities, but rather on the inspiration and training received by the team members. 4. Regional Problems. In the Philippines, medical missions are often done tied to local government. Often they are done for political ends. As such it, perhaps, can be tied to political corruption. Additionally, medical missions may provide an excuse for local governments not to provide an adequate health infrastructure. Further, local churches, who partner with medical missions for supposedly spiritual ends, often use medical missions for little more than to try to lure people away from other local churches. Such selfish attitudes hardly justify all the work involved. ———————————— Biblical Question There is another reason given by some people for opposing medical missions… Medical Missions are not Biblical. These people would argue that secular medical care is not God’s way. Godly healing is through prayer. I, personally, have great problems with this argument, but I suppose it should be addressed. In the Bible, there are a number of health practices listed. a. Prayer and miraculous healing. Elijah, Elisha, Jesus, and the 12 disciples (and others) did at times do miraculous healing. Irenaeus in the 2nd century showed that miraculous healing was at least occasionally still done at this time. b. Public health practices. Leviticus chapters 13 and 14 describe the priests’ job to diagnose, quarantine, and inspect people with skin diseases. Likewise, Ezekiel 34 (the Parable of the Bad Shepherds) condemns the civil and religious leaders for failing to care for the physical needs of the people. Moses in Numbers 21:8-9 placed a bronze serpent on a pole to provide healing for his people bitten by snakes. This shows that public health and the miraculous can overlap. c. General care. Matthew 25:31-46 describes people who please God and this includes those who care for the sick, hungry, thirsty, homeless, and naked. This is general (or nursing) care dealing with issues of physical deprivation and illness. During the Antonine, Cyprian, and other plagues in the Roman Empire, caring for the sick and burying the dead was a major ministry of the local churches. d. Medical care. A key passage of classic medical care is Luke 10:25-37. This is the parable of the Good Samaritan. 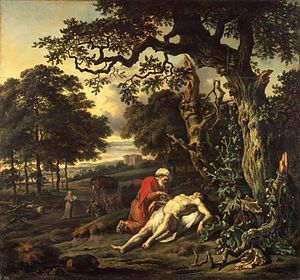 In this parable, a Samaritan discovers a man who had been robbed and brutalized by highwaymen. The Samaritan applied oil as a salve, wine as a disinfectant, the bandages to protect the wounds and promote healing. Then he transported the injured man to a place for healing, nursed him for one day, and paid the innkeeper money to continue nursing. The purpose and application of the parable demonstrate that this story describes a sound Christian ministry. The purpose of the parable was to explain the meaning of the phrase, “and love your neighbor as yourself.” The application is, perhaps, even more direct since in verse 37 Jesus tells those listening that they are to “go and do likewise.” Paul suggested wine to settle Timothy’s stomach. Additionally, in James 5:14-15, church leaders are to pray for and apply oil to the sick. Some interpret this in purely miraculous (or at least spiritual) terms. However, since oil was part of classic medical treatment, symbolically it appears to show medical and spiritual working together. I am well aware that the interpretation of the James 5 passage is controversial… but that’s okay with me. To me the James passage suggest the overlap of the medical and the miraculous as the Numbers passage shows the overlap of public health and the miraculous. The point is that the Bible describes many levels of health care. To look at one type of health care as being God-ordained is simply denying the breadth of God’s working. Part III of this series looks at the Correct Purposes of Medical Missions.